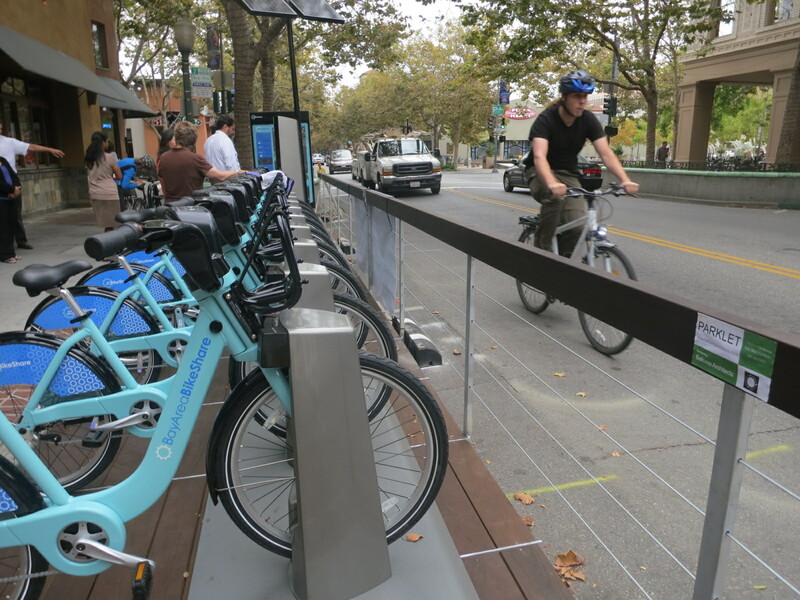 Bay Area Bike Share’s ten-fold expansion announced last Thursday will vastly increase the usefulness of bike-share in SF, the East Bay, and San Jose at no cost to the public. Peninsula cities, however, won’t be sharing in the bounty unless they chip in some of their own funds. Without public support, the 20 existing stations in Mountain View, Palo Alto, and Redwood City are in jeopardy of being relocated. None of the Peninsula cities which received bike-share stations as part of the initial pilot program are slated to get new bikes under the terms of the draft contract with Motivate, the bike-share operator [PDF]. However, the contract does keep the door open for those cities to negotiate expansions with Motivate. Motivate plans to expand the current Bay Area allotment of 700 bikes to 7,000 by November 2017, with 4,500 bikes in San Francisco, 1,000 in San Jose, 850 in Oakland, 400 in Berkeley, and 100 in Emeryville. The contract says those cities were selected because that’s where ridership is expected to be highest. An additional 150 bikes will be sited somewhere in the system, according to the same criteria, with 50 of those reserved for the East Bay. The new Motivate proposal will also render moot a plan to expand in San Mateo, which was previously included in a 2,500-bike system envisioned under a now-defunct MTC agreement last year. According to an MTC staff report [PDF], that plan included Oakland, Berkeley, Emeryville, and San Mateo. Peninsula bike-share would be more successful if the station network was denser, covered more ground, and connected to more major destinations. To make that happen under the terms of the new contract, Peninsula cities will have to pay into the system. The contract lays out an arrangement where Motivate (formerly Alta Bicycle Share) can operate in the Bay Area under a model closer to the successful Citi Bike in New York City, which Motivate also operates. Motivate would be granted exclusive sponsorship and advertising rights to Bay Area Bike Share’s bikes, stations, and website in exchange for expanding and operating the system. The five cities that negotiated the expansion with Motivate won’t have to subsidize their new stations, but Peninsula cities would have to pay a “to-be-negotiated, per-dock fee” in order to participate in the expanded Bay Area Bike Share, according to the draft terms of the contract. “Existing pilot cities other than San Francisco and San Jose that want to continue and/or expand existing system operations after the expiration of the BAAQMD contract can engage in negotiations with Motivate after term sheet signing to develop a new agreement using public funds,” the contract states. In other words, Peninsula cities will be able to expand their bike-share networks, if they decide it’s worth public funds. The proposed ten-year bike-share contract between MTC and Motivate will go up for approval by the MTC’s Administration Committee on April 8, and the full MTC on May 27. How much would it cost each of the peninsula cities to buy into the system and increase the number of stations 10-fold? Everyone agrees that the existing bike share system on the peninsula is worthless because of sparse stations, but how much would it cost to make it useful? Are any of the cities willing to foot the bill (or find corporate sponsors to foot the bill)? 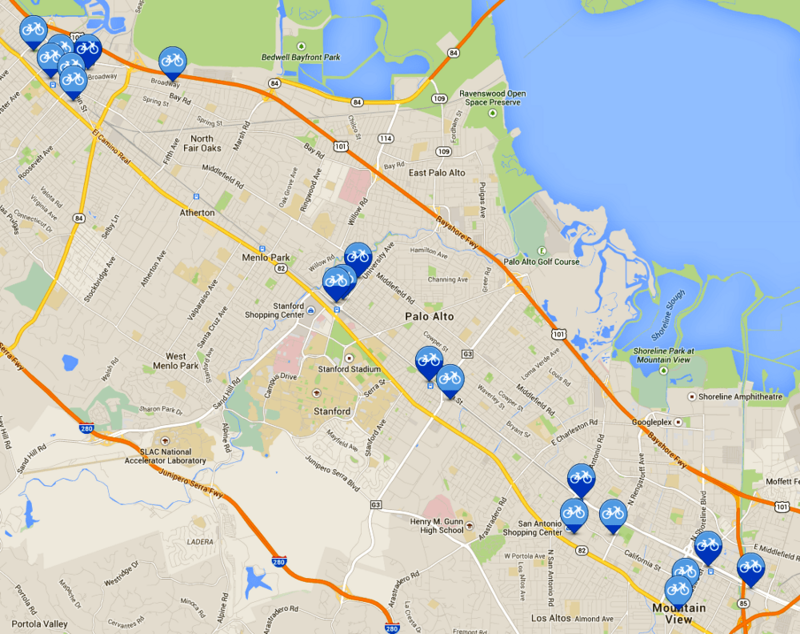 Stanford would be a great spot to put in a few bike share locations. The Caltrain station is far enough from the center of campus that it’s not a convenient walk but a quick and easy bike ride. Though the Stanford Marguerite Shuttle already serves most Stanford trips and is free. Stiff competition for bikeshare. Maybe, but bikeshare is always meant to complement standard public transportation, for people who aren’t going exactly on the bus routes, or don’t want to wait for the bus, or just enjoy biking. Getting on Caltrain with a bike in SF to commute to P.A. (or elsewhere in the South Bay) can be a hassle, and I could see people using bikeshare at both ends. Are there any examples of bike share being successful in other suburban areas? The Marguerite goes around Campus Drive. It can’t get to locations in the center of campus (just as cars can’t.) It is also much slower than biking. (Even driving a private car is slower than biking.) It also operates on an extremely reduced schedule on weekends. When I go to Stanford, I lug my bike up and down the stairs on Caltrain (not easy for me) because it is *so* convenient to have a bicycle with me when I get there. Every time I bike up Palm Drive I am struck anew by what a bicycling paradise the Stanford campus is. So flat, such beautiful bike paths, so much car-free space. The article above repeatedly and erroneously refers to a contract. There is no contract, only a “proposed term sheet used to facilitate discussions between MTC and Motivate” The contract will be hundreds of pages long and actual contract negotiations have not even started. During the rush hours the Palm Drive/El Camino area becomes a traffic mess (with poor design and large traffic volume) that it would be faster to bike through the area rather than waiting 2 to 3 traffic light cycles to get to the train station. I think the point is that cities will have to finance it, though that hasn’t been finalized yet – it will be on May 27, as the article states. Less than to build one (vehicle) parking space in a garage.